Posts written solely by Adam. Last week, I wrote my two U.S. senators, Sen. Jim Inhofe and Sen. James Lankford, regarding the Republican-controlled Senate’s unwillingness to hold a hearing for newly-nominated Judge Garland. Here is the response I received from Sen. Inhofe and my reply back to him. I really don’t understand how they cannot see that their rationalizations can be extended out to absurd levels. Yes, I think they are acting within their Constitutional rights, but they could technically defer their “advice and consent” indefinitely and still be within the technical bounds. It’s so frustrating to me! Thank you for your recent correspondence regarding the vacancy on the Supreme Court and the nomination of Judge Merrick Garland to fill the spot. As your representative in Washington, I appreciate hearing your concerns. Since the devastating loss of Justice Antonin Scalia in February, much controversy has surrounded who his successor will be. On March 16, 2016, President Obama nominated Judge Merrick Garland to the position. Judge Garland was an exemplary model of justice when he oversaw the prosecution of the Oklahoma City bomber, Timothy McVeigh. As an Oklahoman, I am forever appreciative of Judge Garland’s actions on behalf of our state. I have spoken with Judge Garland since his nomination announcement and made it clear that this is about the process and not about him personally. It is important for the upcoming presidential election to be about citizens like you deciding the direction the Court will take. We have seen time and again that when President Obama is unable to get his liberal agenda through Congress he has turned to executive actions and agency rulemaking to implement his priorities. These regulations and actions are now making their way through our courts, and many of them will be heard by the Supreme Court within the next year or two. The President and Senate Democrats want the Senate to confirm someone who will uphold these executive overreaches, but the American people elected a Republican-majority Senate to oppose President Obama’s policies. With the balance of the Supreme Court now at stake, the choice to fill this vacancy will shape our nation for at least the next generation. Americans just like you are the ones who will bear the burden of these court decisions; therefore, you should have a say on who fills Justice Scalia’s vacancy. Senate Majority Leader Mitch McConnell and Senator Chuck Grassley, Chairman of the Senate Judiciary Committee, have made clear that the Senate will not hold hearings on a nomination until the next president has been elected. While the president has a Constitutional duty to nominate a justice, the Senate also has the Constitutional duty to provide “advice and consent,” and it is fully within the purview of this body to withhold that consent while completely fulfilling our Constitutional duties. I appreciate your respect for Judge Garland. You assert that “the American people elected a Republican-majority Senate to oppose President Obama’s policies”. I disagree and think that it is just as likely that several other factors contributed more heavily to the swing in party majority. In either case, I think we can both agree that the current Senate composition is the most recent representation of the American people. If so, would it not be best for the Senate to hold a hearing for Judge Garland since they are the current, best representation of the American people? What if Americans elected a Republican president in November and swung the Senate back to Democrat majority (complete hypothetical; I don’t even know if the right numbers of Senators are up for re-election)? Should the now-Democratic Senate say we should wait four years until the American people have their say again? Can’t you see how this can be rationalized infinitely? I can understand how you consider it in the purview of the Senate to withhold the consent. Please consider how that is a slippery-slope. No other Supreme Court vacancy has been handled in this way. Yes, Joe Biden made the argument many years ago for what the Republicans are doing right now, but the Democrats never followed through on that. Who is to say the precedent doesn’t get stretched further down the road? What is the cutoff for how long the Senate can wait? Can it be two years? How about three? Following the rules strictly, the Senate could wait until we had fewer than six justices (since that constitutes a quorum). You could do that, but can’t you see that it is a ridiculous notion? This current rationalization is ridiculous in the same vein. I appreciate your response. I am a registered Republican and have only ever voted for Republican Senators in my lifetime. I value Conservative ideals, but I value common-sense much more. This behavior by Senate Republicans is complete nonsense, and I hope you can come to see that and fight for common-sense in our legislative branch. Thank you. Dr. Reiner Knizia, designer of many, many classic boardgames, once said “When playing a game, the goal is to win, but it is the goal that is important, not the winning”. So true. I thought I understood this before, but I didn’t. To me, this quote isn’t just about being a good winner/loser; it also encompasses enjoying the journey. Several times thoughout this challenge I would tell myself before we started a game that I wasn’t going to over analyze my moves to the point of absurdity because I needed to enjoy the experience. Inevitably, I would find myself doing the calculations in my head of the benefits/costs of each possible move such that I hardly even noticed that my opponent was even in the room. I could have been playing against a computer for all the attention I was giving to the social experience. The social experience, for me, is the most rewarding thing about game playing, but it was too easy to focus on being the winner. Everyone needs to play to win, or it isn’t fun. That’s why games with lopsided rules or unbalanced game play are no fun because both opponents can’t really play to win. My focus was often playing to be the winner; this subtle distinction made for a huge difference in my enjoyment. Once I learned how to actually “play” with others, it became much more enjoyable! Unfortunately, some games are just bound to fail with specific groups. We found one such game (Call of Cthtulhu) that just doesn’t work with us. We become overly hostile while playing it, and it never ends well. We have learned that games with such overt conflict, where every move is about tearing the other person’s position down, do not work with us. Games are all about gaining the edge, but building up my own settlement/economy engine/zombie horde in comparison to how my opponent is doing is vastly different than simply bringing theirs down to the ground consistently. It actually relates really well to life. We compete at EVERYTHING. You’ll notice that good things often come about when the “competitors” are building upon/creating their own stuff; in contrast, when we compete by tearing down others to look better ourselves, no one wins. War. Smear campaigns. I-told-you-so matches. We need to make sure that we are enriching ourselves and the world around us. Anyway, I could probably write on many other things that I’ve noticed as we’ve played so much. It’s really amazing. We have slowed down quite a bit since it has stopped. I’m really grateful to Jessica for doing this with me, and I’m sure she is as well. 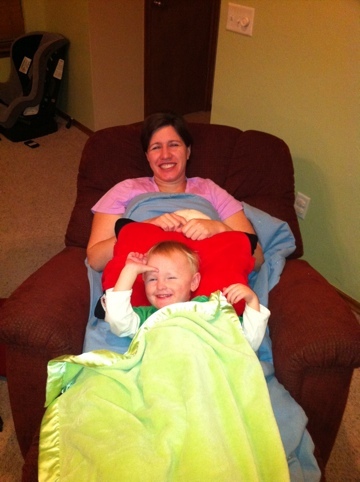 Since Spencer has been here with us after surgery, he can’t stay away from his momma on the chair. Luckily, he can climb up by himself. Here was an awesome place that he requested specifically. Spencer riding it for one of the first times. I’ve changed his cloth diapers before, but I’ve never done the whole shabang by myself. This involves using them throughout the day and having to deal with any poopies as well as washing/drying them at night and re-stuffing them. I was all gung-ho about it. I was on board. In fact, I’ve never had any issues yet, and I’ve been behind Jessica 100% with this. I still am, but I think my weekend of cloth diapering is over. That’s right: after one diaper change I may be going disposable until Jessica gets back. Here’s why. The very first diaper I changed after we got back from the airport was a poopie. It stank pretty bad, but I’m a veteran. I don’t cringe in the face of duty. I wisely removed the cover from the changing table, not knowing whether the wet in his pants was pee or poop (gross!). I laid him down, pulled down the pants and diaper, and there it was, Lake Spencer. Maybe Mud-Bog Spencer or Swamp Spencer would be more accurate. It was definitely liquid, but with solid leanings. Please understand, I’m not a noob when it comes to these things. I have always done my fair share of diapers, poop and non-poop alike, but this one was massive and disgusting. And the worst part? I knew I couldn’t just wrap it up and throw it away. I cleaned off Spencer’s bum while trying to keep his hands from investigating The Swamp and finally managed to get poop separated from baby. I set him down, bottomless, and sent him to the bath tub. I very carefully carried The Mud-Bog to the toilet and prepared to dump it out like I’ve been instructed. Jessica’s told me that you just dump out what you can and then put the rest in the pail. First of all, this was NOT going in the pail because I didn’t want to have to SCRUB sloshed over swamp-stuff from the pail. That meant it was going straight to the washer, but I wasn’t going to throw all the “mud” in there. My problems increased as I realized it was just in that “sweet” spot on the liquid/solid scale that it wouldn’t dump out of the diaper. I balanced it in one hand while going to get water in a cup with the other hand and tried to rinse it off into the toilet. That was fine for the first time, but then I realized I had to get more water, but now I had a dripping swamp-diaper that I had to balance just right so it wouldn’t come out while I got to the faucet. I did this about 5 times and decided it was ready for the washer. Unfortunately, on my way over there, the now mostly water/somewhat poop stuff on the surface of the diaper started to drip out, so I had to catch it with my hands. This does take two hands to achieve such a feat, and I found myself at quite a loss for how to open our front-loader washer. My feet soon sprang to action, and I really hope you can get the vivid picture of me juggling the swamp diaper while dancing on one foot while the other is tangled up in the washer door handle. It even makes me laugh…now. P.S. I really am behind you a 100% sweetie! Just not for the next couple days! I love you! In case you hadn’t heard of it, Jessica and I have a board game that we quite enjoy and just finished playing: Lord of the Rings. It’s a little more complex than your traditional Monopoly or Risk type of game, but it plays pretty quickly in about an hour. Its main distinctive trait is that it is a cooperative game in which all the players play their hands individually on the same team against the board. The board controls Sauron, and each of the players plays a hobbit. The hobbits try to make it through all the main locations in the trilogy while dealing with all sorts of troublesome events like you find in the books. They must work together to make it to Mt. Doom and throw in the Ring. I just thought this deserved a mention because our reactions to it while playing are so unique. Inevitably, as we are finishing this game, the mood gets really tense as we make our final plans to avoid meeting Sauron. When we die (lose), we yell (yes, yell) out in frustration, and when we chuck the Ring we yell in triumph. Yep, it’s that engrossing. Anyway, if you want to learn more, click here. It’s a bit expensive (brand new $50, used off eBay maybe $35-40), but we’ve quite enjoyed it. It’s our first game venturing into the expansive board game world (see http://boardgamegeek.com for more), and I’m looking forward to getting a lot more of these types of games. We had our annual ice storm start today and that meant longer commute times for me and house-relegation for Jessica. For those of you not familiar with them (I know I wasn’t before I came here), the ice storm is simply misting rain in sub-freezing temperatures with the end-result being a nice sheet of ice on EVERYTHING. 1. It is possible to drive your car too slow on an ice-covered road. This one guy almost caused a five-car pileup because a unique situation required a bunch of people several cars behind him to “slam” on their brakes because of the slow line he generated. 2. When scraping ice off the car window, once you have some of the ice off at the bottom, it is best to flip the scraper over from the normal motion. The normal scraping works fine for thin layers or snow, but with thick layers it just jams the contact portion of the ice into the firmly planted portion behind it. With the inverted motion, it redirects a lot of your force outward from or perpendicular to the window. This is effective because the warming air on the inside of the car (you turned it on, right?) has created a thin layer of melted ice on the part touching the window, and it needs a prying motion more than a jamming one. Hope that makes sense.